The PNW is a beautiful place to live any time of the year, and part of what makes it so beautiful is the abundance of trees. This time of year, however, that can be a problem. Your roof is meant to protect your home from wind, rain, snow and ice, and this time of year, that protection is really put to the test. Let’s talk about what to do after a storm, and how to prevent damage to your roof. Fallen trees, heavy snow, ice dams, heavy rain, high winds, these are some of the things that we have to deal with. After any storm, it is important to take a look at your roof and check for any damage. Roofing companies will be especially busy during this time, so it is important to not put it off in case you have to wait for repairs. If not addressed in a timely manner, more damage can occur to the interior of your home. It’s not always easy to see damage however. 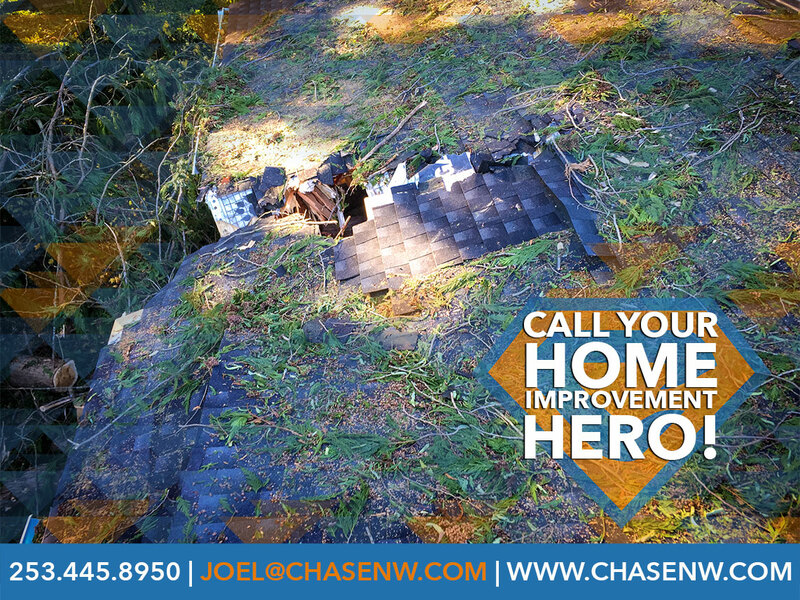 Its obvious if a tree fell on your roof, shingles were blown off, or hail cracked a skylight, but what about hidden damage? Adding Curb Appeal with a New Roof! 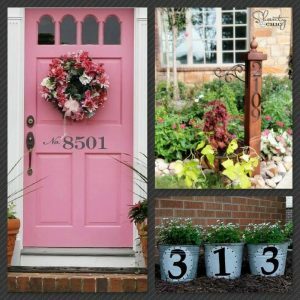 Displaying your house numbers in a creative way is a relatively easy way to add some curb appeal. There are many ways to execute this concept, that you can do yourself! Again, are you following us on Pinterest yet? Roofers from all over the Northwest will be congregating at the Tulalip Casino today for this year’s Northwest Roofing Expo. As a Master Elite Roofing Contractor, we headed up yesterday to spend time with other leaders in the industry, but the rest of the public arrived here today. Starting at 7am for breakfast, this year’s expo is shaping up to be a memorable one! We at Chase Construction NW, Inc. love our community, and we are always looking for ways to give back and help those in need. Our Master Elite Status gives us opportunities that we wouldn’t have as a typical roofing contractor. Not only can we provide better service to our customers, as we are held to higher standards and training, and provide superior warranties, but we can also better serve our community! Below are a couple of programs that are available to Master Elite Contractors through GAF that help us do just that. GAF Territory Managers Donovan Gladstone and Tom Stancik along with 4 GAF Factory Certified Master Elite Contractors recently attended the 30 Year Anniversary Habitat For Humanity Benefit Luncheon. And we were privileged to be one of those invited. GAF partners with it’s Master Elite Contractors providing a certification called a “GAF Certified Community Contractor with Habitat For Humanity” where the contractors with this credential commit to providing free labor roofing at least 2 roofs per year and up to 4 roofs per year, and GAF provides all of the materials for the entire roof packages along with an enhanced roof warranty for free! What to do in the Beautiful Puget Sound this Weekend! Here at Chase Construction North West Inc., we do all we can to be involved in our community! Our company always remains close with all of our customers, and we love seeing them after their beautiful new roof has been installed. We put our all into our work all week and we truly enjoy getting out in the beautiful Puget Sound and meeting more of our lovely neighbors on the weekend. We know how busy life can get, which is why we want to give our top picks for what to get out and do with your friends and family this weekend! We hope to see yo158u there Puget Sound! This event is Western Washington’s only sportsmen’s show and will include many exciting features! The event will spotlight the one-of-a-kind indoor “Steelhead River” and when there, you can enjoy over 150 hours of free “how to” seminars, camp cooking demonstrations, the Kid’s free Trout Pond, the “Head & Horns” competition and much more! The weather is getting beautiful and it is the perfect time to again start planning outdoor adventures! The Washington Sportsmen’s Show will offer professional guides, outfitters, and other resources to facilitate in making fishing, hunting, and wildlife-watching trips a reality!